Home » recipes » Try this Easy Ravioli Sauce Recipe for Dinner Tonight! Try this Easy Ravioli Sauce Recipe for Dinner Tonight! Pasta is a go-to around here. Ravioli is a family favorite in our house. This easy ravioli sauce recipe adds a bit of flare to the basic cheese ravioli I know everyone will eat! By adding this easy ravioli sauce recipe to premade ravioli, you end up with a delicious dinner that is oh so creamy. It’s kind of like macaroni and cheese taken to another level. 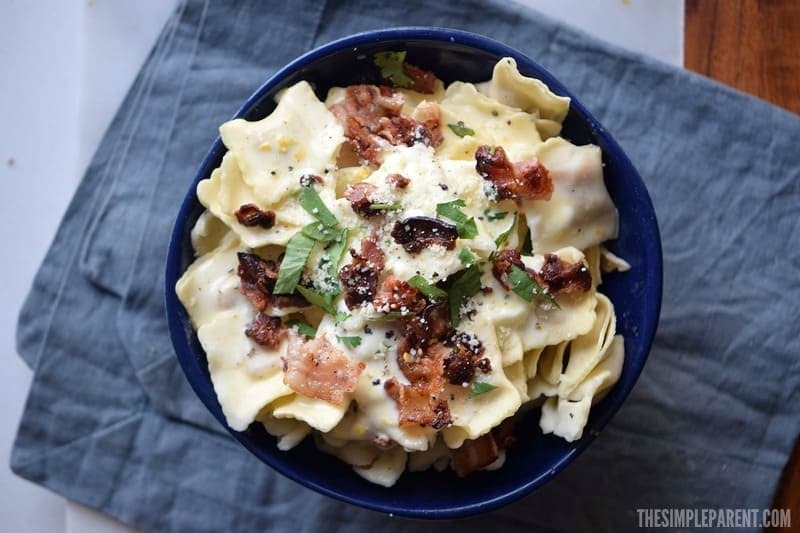 It’s creamy and velvety just like mac and cheese, but it’s packed with a lot of flavor! It’s amazing what adding a quick, easy ravioli sauce can do! Because we make it with ravioli (which is filled so it’s already one of the most flavorful pastas around) we get an extra flavor boost! Bring salted water to a boil. Add the ravioli and cook until al dente as instructed on the package. In a saucepan, add heavy cream, cornstarch, salt, pepper, and ground mustard. Stir over medium heat until it thickens. Add the mozzarella cheese and stir until it melts. Then set aside. Drain the pasta when done and transfer to the saucepan with the creamy cheese ravioli sauce. Mix well. 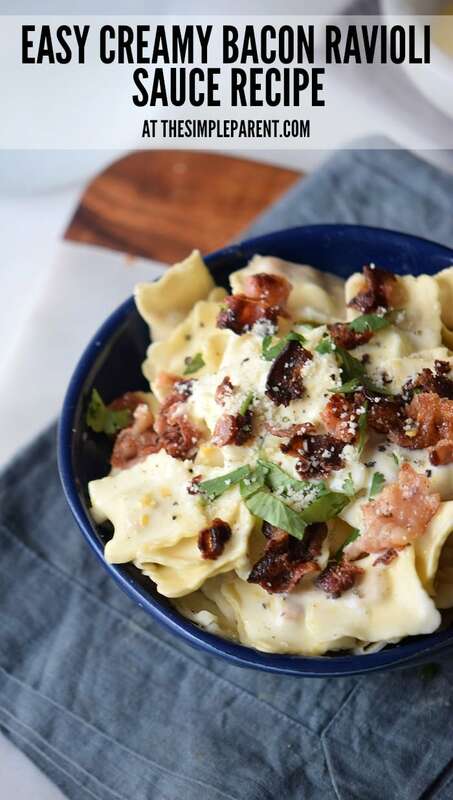 Serve pasta in individual dishes, and garnish with bacon, basil, and parmesan cheese. Why is this easy ravioli sauce recipe so amazing? I think it’s because of all the cheese and just the right hint of spices. Add bacon to any recipe and I’m a fan. 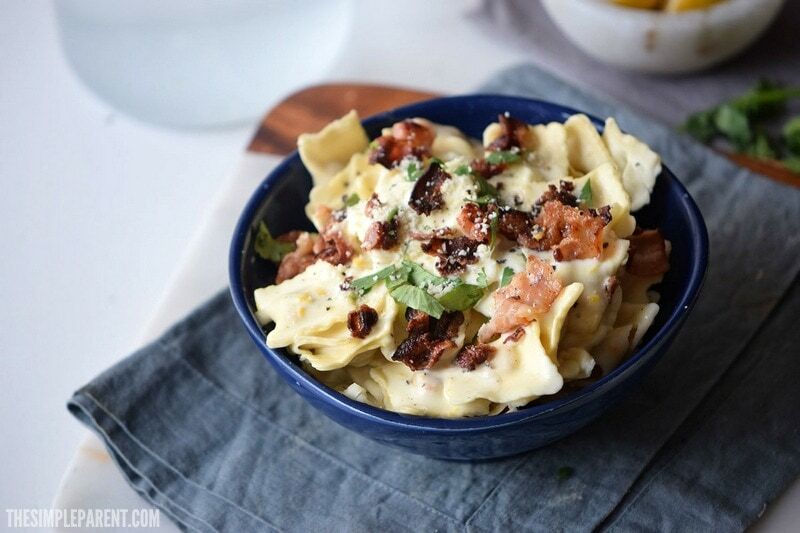 A quick, easy ravioli sauce that is super cheesy and has bacon? Count me in! The kids have mixed feelings about it. Carrigan is a huge fan but Weston (my picky eater) prefers his ravioli without any creamy cheese ravioli sauce! He actually prefers no sauce at all! Oh well, I guess we can’t win them all! Making a big pot of this is the ultimate weekend comfort food however, it’s also a really easy and quick dish that can double as a great weeknight meal when you are craving some warm and homemade delicious food but don’t have a lot of time on your hands.